Mister Rogers arrives with a collection of badges which he shares as he explains the meaning of each one. 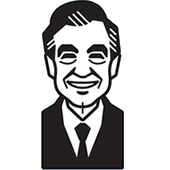 Moving outside, Mister Rogers sits on the porch swing and sings You Are Special. Officer Clemmons stops by and shows the police badge he is wearing. He describes his duties as "special patrolman" -- to "instruct other policeman how to help people be safe" -- before singing You Are Special. Mr. McFeely arrives and asks Officer Clemmons to visit the Neighborhood of Make-Believe where they are requesting a permit for the upcoming street fair. In the Neighborhood of Make-Believe, Miss Emilie talks with King Friday about his Kiss the King booth he is planning for the fair. She offers him a poem for his booth: "Kiss the king. Come kiss the king. Ring the bell. Come kiss the king." King Friday suggests that Miss Emilie use the castle's P Room during the fair to share her poetry. Meanwhile, Handyman Negri is dressed as a bull and Lady Elaine Fairchilde as a cowgirl in preparation for their contribution to the fair. Officer Clemmons arrives and issues the permit for the street fair. He talks with Lady Elaine about police officers and their duty to keep people safe. With Handyman Negri, he sings You Are Special. Moving to the castle, Handyman Negri and Lady Elaine find X the Owl wearing a badge with the letter "O." The "O" is for "orange" as he is preparing his booth for the fair where he will offer freshly squeezed orange juice. Back at the house, Mister Rogers makes his own street fair badge out of paper and foil.